Shred Size: 1/8" x 1/4"
Dimensions (HxWxD): 22" x 13" x 17"
The Swingline™ SM12-08 shredder is a micro cut shredder suitable for shredding confidential documents in a small office environment; the micro cut shredder's cut size is securer than most shredders cut sizes. The Swingline™ shredder shreds paper, staples, and paper clips only. 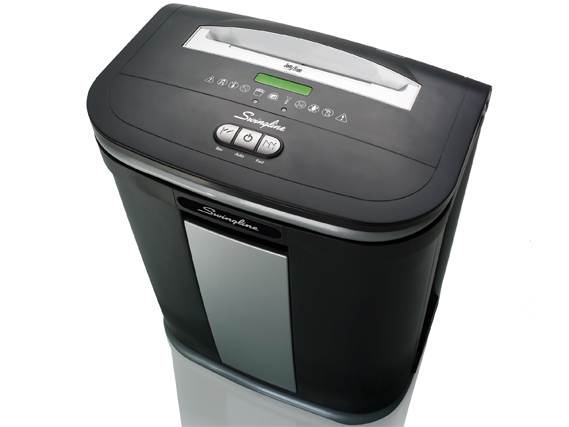 The Swingline™ SM12-08 shredder is a Jam Free™ shredder; shredding continuously thanks to JamFree™ technology. The Jam Free™ shredder stops shredding when excessive papers have been fed; indicated by blinking. The Jam Free™ shredder reduces operational costs by automatically going into sleep mode. The micro cut shredder includes thermal overload protection. The Swingline™ SM12-08 shredder allows the use of plastic or paper bags in its waste bin; with the Swingline™ shredder indicating when the bin is full. The Swingline™ shredder's automatic cleaning of the cutting blades improves the shredding process. Minute cut size that can't be joined together. JamFree™ technology prevents paper jams. Automatic cleaning of blades removes dangerous particles that would harm the blade. Cut Size 1/8" x 1/4"